With the arrival of a few key films that I will need to complete this endeavor, the Carole Lombard Filmography Project (hereafter known as the CLFP) is now underway. As mentioned in a previous post, it will begin with an exploration of the life of Carole Lombard–tragically short, but full of zest and purpose. She was born Jane Alice Peters in Fort Wayne, Indiana, the third child of Frederick Peters and Elizabeth “Bessie” Knight, on October 6, 1908. Bessie relocated herself and her three children to California after her divorce from Frederick when Jane was 8, owing to fear of Frederick’s frequent outbursts at the family. Her career began very early, with a small role in A Perfect Crime (1921) at the age of 12, and in 1925 she signed with Fox Studios (under her new name of Carol Lombard–the “e” would come in later), appearing sporadically in silent films which included a stint as one of Mack Sennett’s famous “bathing beauties” at the end of the 1920’s. 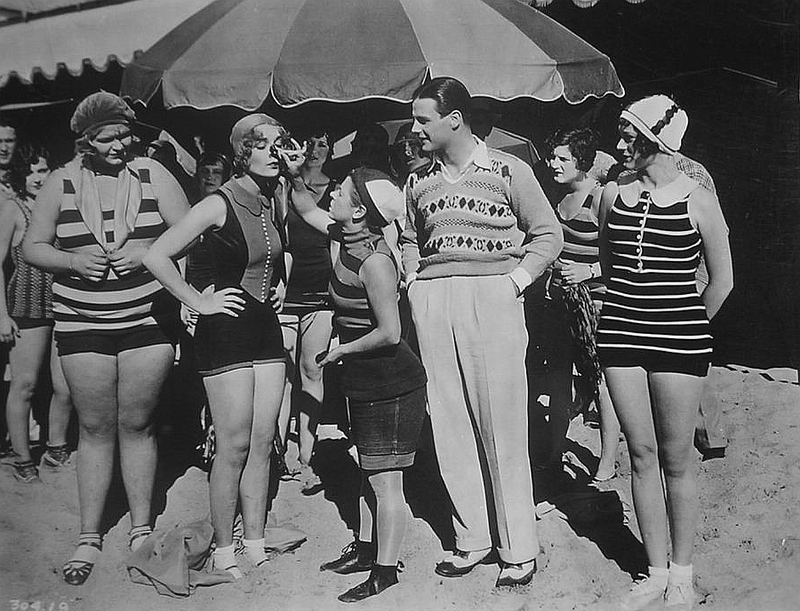 Between takes of The Swim Princess (1928). Her performance in Man of the World (1931) teamed her with William Powell, with whom she soon fell in love. The two were married in June of 1931, but the marriage was short-lived and they divorced in 1933. However, they remained close friends, and went on to star in together once more in the hilarious My Man Godfrey (1936) after their divorce. Before shooting No Man of Her Own in 1932, Lombard was introduced to her costar in the film, Clark Gable. The two had magnificent chemistry onscreen, and a few years later they became a couple, despite Gable’s still being married to Rita Langham. Gable divorced Langham in March of 1939, and he and Carole married later in the month. The happiness in the marriage was legendary. Gable adored Lombard and vice versa. Gable was putty in her hands–in a notable instance, Lombard, an active liberal Democrat, used her charms to convince the Republican Gable to vote for Roosevelt in his reelection campaign. He was known for his willingness to do anything for her, and despite their hectic schedules, the two managed to get away often, spending time fishing and relaxing at their ranch home in Encino. 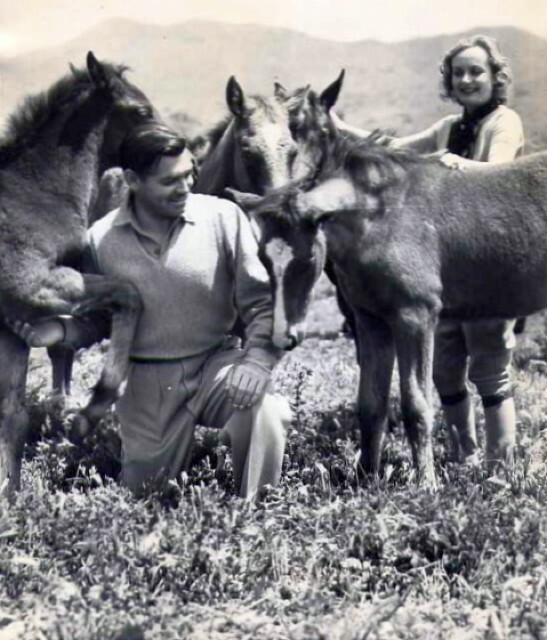 Gable and Lombard at their ranch home in Encino. Signing autographs in Indianapolis after the bond rally. Bessie, who accompanied Carole on the tour, proposed taking the train home, but Carole insisted on flying, as she wanted to get back to Gable as quickly as possible. Lombard, her mother, and press agent Otto Winkler boarded TWA Flight 3 in the early morning of January 16, and a few hours later landed to refuel in Las Vegas. 23 minutes after takeoff for the final leg of the trip into Los Angeles, the plane suddenly and inexplicably crashed violently into Mount Potosi. Lombard, her mother, and Winkler were killed, as were all of the other 19 passengers onboard. At the scene, Lombard’s body was identified by a pair of ruby clips that were given to her by Gable. When Gable heard the news, the movie star who was known for being tough as nails broke down immediately, and in the following months he aged noticeably by about 10 years. Shortly after the crash, per a request of Lombard’s at the outbreak of the war, he joined the Air Force, and carried the ruby clips in a locket around his neck for the rest of his life. Despite being married twice more, he is interred next to Lombard, whom he considered the love of his life, at Forest Lawn Memorial Park. Thus went the short but significant life of Carole Lombard. I look forward to profiling her 78 (holy moly!) films here, and the project will take as long as it takes to get them all finished. It truly is remarkable that in her 33 years, she managed to make 78 movies, more than many other stars who outlived her by decades. For more on Carole Lombard, I would highly recommend Carole & Co., a site run by my friend and fellow CMBA member Vince. 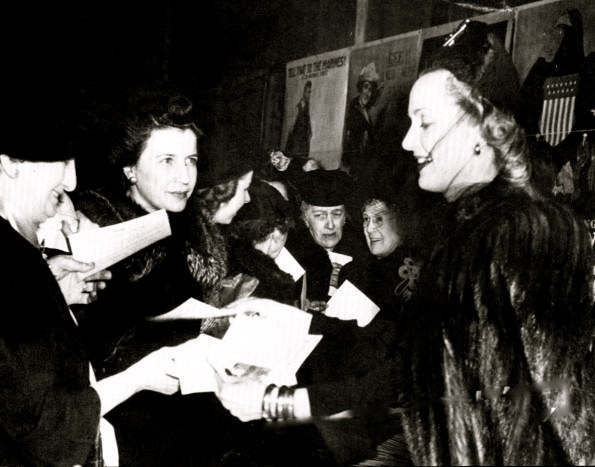 It has the most complete collection of facts and photos of any other Carole Lombard site I have come across on the web, and I am hopeful that Vince may, in the coming months, be writing a guest post for the CLFP. Stay tuned! Such a beautifully written article! I have so much more respect for Gable after reading this, but thanks for not making it TOO soppy. Would it be all right if I contributed something about Lombard at some point? This has got me interested in participating. A nice primer on Lombard, and I look forward to future installments (and my contribution down the line). I very much look forward to your contribution, Vince! Awesome idea! Love it as Carole is my all time favorite actress! This will be one series I will be checking on regularly! I’m so glad to hear that! Since Carole is one of your favorite actresses, would you like to contribute a guest post at some point? Let me know!